Happy New Year! It's hard to believe that another year has gone by. This year, I did't think I would have any resolutions - I have always disregarded them because I feel we should try to better ourselves all the time. But this year, something came to my attention that I felt needed to become my life-long resolution. Did you know that the fashion industry is the second leading environmental hazard? The first being none other than oil. Finding out this information was astounding. I love fashion and it's that bad for the world? Well, it’s because there is so much waste. Trends go out quickly, clothes get thrown away, etcetera - you get the (very ugly) picture. I’m not going to get into the nitty gritty, there is so much information about this issue and you should DEFINITELY research it on your own (this documentary is a great place to start - The True Cost). But there was something else that I realized through this, Basil is technically a sustainable company! We give clothes, textiles, and accessories that were no longer wanted a new purpose. Vintage clothes reappear in current trends constantly. Obviously we want to stay on trend but more often than not, what’s currently in vogue is a replication of styles from the past. A lot of clothes that are made brand new are made with vintage looks in mind! Why not recreate the look with vintage? At this point it’s one of a kind, as opposed to getting something new and cheaply made that everyone else has too. I would much rather invest in my clothes than have “everything” that is cheap and doesn’t look as nice. Why look like everyone else? When you have a vintage piece of clothing that fits your perfectly and is tailored so elegantly, you never want to take it off. Trust me. 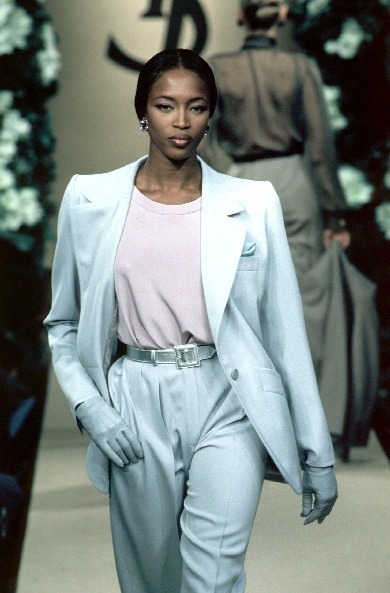 Here are some photos of Naomi Campbell, Kate Moss, and Tyra Banks wearing things that are recurring in today's trends/looking bomb af. My point of showing these photos is that a lot of the clothes pictured were made 30 years ago and are being recreated CHEAPLY from unsustainable companies today. You can so easily find so much of this stuff second hand. Can't be bothered to do the digging? Well, that's where I come in. So for 2018 and beyond, let's stop looking like everyone else and be more open to recreating looks, or investing in statement items (gucci loafers, etc). And let's start taking care of our planet and bettering our sense of style. Cheers to a new year, full of possibilities and endless style.